Forty-five minutes later, with fifteen minutes to spare, we successfully exited the escape room. I stopped one of the game managers. “No, really, very few teams make it out. People just…they don’t communicate. That’s where almost all of them fail,” she said, shaking her head slightly. If good communication is necessary for accomplishing quick 1-hour goals, imagine how important it is for larger teams with more complex goals. If you’ve ever done something not-alone, you know information exchange is extremely important for teams. Remove any of these pieces, and both communication and outcomes suffer. But what about when your teammates are halfway across the globe, not halfway across your desk or the hallway? Doesn’t that change things? 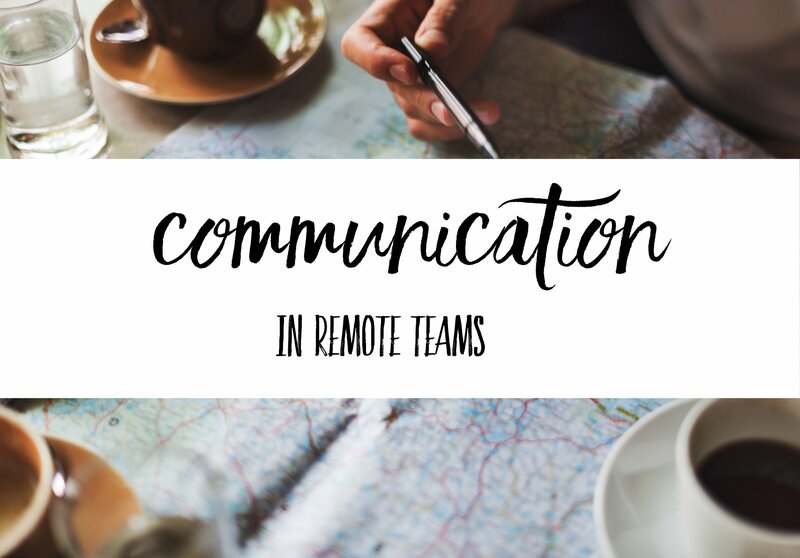 Excellent remote communicators still observe the basic elements of good team communication (remote team communication is, after all, team communication), but they also take a few other factors into account. Information is usually exchanged in writing. Depending on context and the subject of conversation, much (some would argue most) of communication is nonverbal. If you primarily communicate via written methods, identifying correct context and achieving correct interpretation can be an enormous challenge. Remote teams tend to be very diverse. Remote companies can hire talent from all over the world. This means teams often include cultural, gender, age, organizational, historical, and functional diversity (and that’s not an exhaustive list). While diversity can be a big strength for remote teams, it can easily become a big communication hurdle as well. Timezone barriers complicate workflows. Inevitably, a diverse geographical team means teammates working in various time zones. Some coworkers may share similar work schedules while others may only overlap for an hour or two (or not at all). If managers aren’t careful, this can really compound the potential difficulties of written information exchange and diversity. Many companies advocate and run highly productive remote teams though, so these three challenges aren’t insurmountable. Even better news, there are some pretty practical steps any team member can take to boost communication in remote teams. Here are a few general approaches you can take to improve information exchange among your teams. They’re based on what we do at Range and are to proven to help teams kick up the (good kind of) chatter! Listen. This is especially important for very diverse teams. Listen to your teammates and encourage them to share information on their backgrounds, their previous team experiences and how they prefer to communicate most days. Does a teammate’s culture influence how they approach conflict? What about how they make decisions? Identifying these subtleties, and knowing how to manage them, can be very beneficial during conflict. Make use of all forms of communication, including in person. Just because most of your communication may be written doesn’t mean all of it needs to be. Assess the communication channels open to you (e.g. chat, email, phone, video, text, in person) and determine which channels are most effective for different conversations. Communicate often (more often than you’d guess) about a wide variety of topics. While it’s important to talk about work, it’s also important to talk more casually with your teammates. Research implies that teams who build personal connections are more effective. This is why many successful companies advocate water cooler slack channels and other creative ideas that encourage informal conversations. Establish shared processes, goals, routines, and vocabularies. Or, if these are existing, encourage others to use of them. Shared team elements help with context, relaying complex information in short periods of time, and can even help remove common roadblocks like lack of clarity and role confusion. Work on your listening skills: Make it a personal goal to have regular (formal or informal) 1-on-1s with teammates you work with often. Find some questions (like from this list of 1-on-1 questions or these non-awkward ones) ahead of time to help you get to know your teammates and how they navigate conversations. Take a few minutes after each meeting to write down anything new you learned about that person, their personality, or communication style (this will help you remember it). Talk more about non-work: Create a dedicated Slack channel for non-work talk or set aside 15 minutes before team meetings to catch up with one another. Have impromptu Friday hangouts or a beer30 video gathering near the end of a successful day. Use helpful processes: Identify useful processes and routines for your team. Outline how you can more efficiently incorporate these or (if they’re pretty bad) how managers can improve these. Use shared processes to create structure, context, and a common vocabulary. If your team has a tough time working through critical issues, think about encouraging teammates to use the SBAR technique or some other communication model designed to organize complex thoughts. Lastly, depending on your team size and culture, not all of these ideas may be applicable to you. For this reason, one other thing I’d encourage you to do is keep an eye out for how other organizations similar to yours are overcoming these hurdles. I assure you, it’s possible to make the leap! P.s. If you’re interested in further reading or helpful tools, check out HelpScout’s tips for keeping a remote team connected, their excellent list of remote resources, how Zapier builds strong teams despite physical distance, Remotive‘s newsletter, and Auth0’s wonderfully helpful tips on remote working.